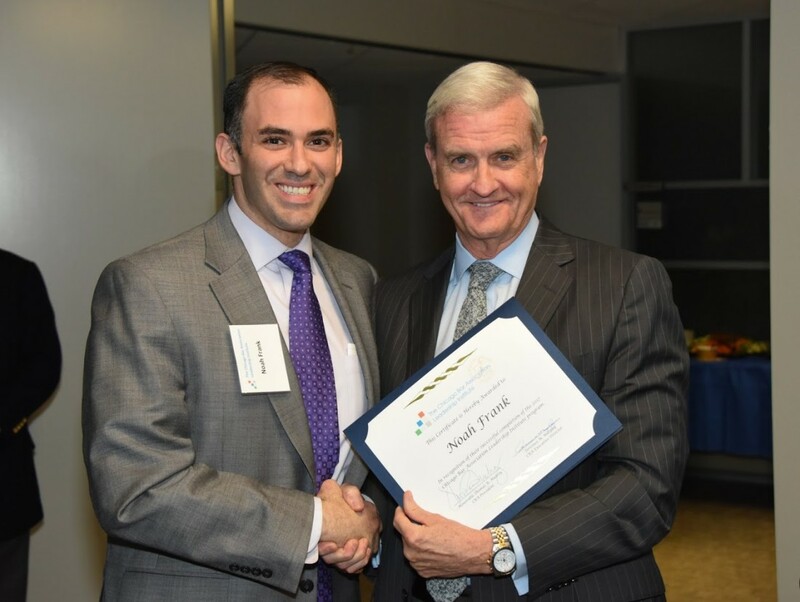 Noah Frank was recently acknowledged for successfully completing The Chicago Bar Association’s 2017 Leadership Institute program at a graduation celebration and reception on November 2, 2017. The CBA’s Leadership Institute is a program designed to enhance the leadership skills and foster the professional growth of Chicago attorneys. The program provides emerging leaders within Chicago’s legal community with the practical knowledge and business development strategies necessary to attain and be successful in significant leadership roles. The year-long program, which featured interactive skills-building educational sessions and networking events, culminated with the November 2 graduation reception where each graduate was presented with a certificate by CBA President Hon. Thomas Mulroy. Graduates were joined in celebration by an intimate group of prominent members of the CBA and Chicago’s legal community at SmithAmundsen’s Chicago Office.